IMI Mailbox Statistics for Microsoft Exchange Server is small utility for Exchange Admin to get, print and export (inventory) Mailbox resources statistics, intended to cover the lack of print capabilities in the current version of the Exchange Admin. Obtain information about all the mailboxes on a Microsoft Exchange Server. Enumerate mailboxes, print statistics and export statistics to Text files (txt), CSV, PDF, RTF, and HTML. 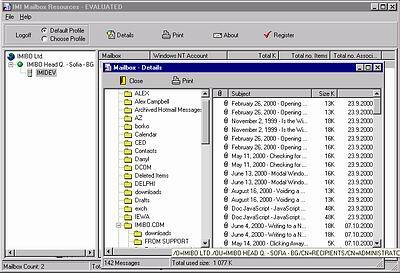 IMI Mailbox Statistics for Microsoft Exchange Server is a small utility. IMI Mailbox Statistics is available in two editions - Standard and Enhanced. Furthermore, the both versions, included add-on named "IMI Mailbox Statistics Console Application". With this add-on (which is totally independent application), most Microsoft Exchange administrators can to automate their tasks and be more productive. The add-on export information to Comma Separated File. Statistics Counter Service is a complete real-time counter hosting tool. Create and test your own sports betting systems and see results on a chart. Provides different basic statistical measures, for example the (co)variance. Qweas is providing links to IMI Mailbox Statistics 2.4.061 as a courtesy, and makes no representations regarding IMI Mailbox Statistics or any other applications or any information related thereto. Any questions, complaints or claims regarding this application IMI Mailbox Statistics 2.4.061 must be directed to the appropriate software vendor. You may click the publisher link of IMI Mailbox Statistics on the top of this page to get more details about the vendor.